Ontario's suckling society of electricity policy enablers remains heavily focused on the conservation message. I hope I won't needlessly brag, but our households electricity usage was reduced to about 1/3rd the level of a decade ago prior to our latest personal infrastructure project, which has dropped it a further 50% over the past month and a half. I'll concentrate in this post on my consumption experience as I develop a basis for future energy decisions. There's a couple of points I take exception to - I'll leave addressing who "We" are until later paragraphs; first, to smart metering and household energy. I've had a smart meter since November 2010, and I pulled some figures for a recent 45-day period to compare to the same period in past years. Some explanation of what this graphic displays: the "2011" period displays what will be the common pattern of weekday demand up until "2015" (I start each year on the previous December 23rd). The dominant demand peak is in hours 6 and 7 (from 5-7 am), and that's the work of programmable thermostats controlling electrical heaters. One small difference is the early evening peak is hour 19 (from 6-7pm) in 2011, but moves to hour 20 the next 3 years, before disappearing altogether in 2015. In 2011 on-peak pricing ended at 9pm, but it moved to 7 pm after that; apparently I was willing to put things off for 1 hour, but not 3. Energy, of course, is not simply electricity. About a decade ago, after a few cold winters in a century home with only electricity servicing it, we had restored a chimney and got a wood stove to work for us. Over a period of 7-8 years we reduced electricity usage by about 36,000 kWh, about 1/2 of which might be attributed not to reducing energy use, but displacing electricity with burning wood. A typical day would have me firing up the wood stove before 7 am, when it would either replace the electrical heat, or the house would cool until the programmable thermostats triggered heat. It's relevant that another energy source combined with electricity in utilizing a programmable control to schedule usage. On December 22nd an Enbridge employee turned on the first natural gas service the old house has had, and the contractors finished installing the forced-air gas (FAG) furnace system. If you look at the graph of hourly demand for 2015, you might note the morning peak moved to the utility's "on-peak" billing hour of 7-8, while the evening peak disappeared altogether - because now I am cooking with gas. 5 years after a smart meter started providing me hourly electricity data, he brand new natural gas meter is just a dumb meter, so I can't compare hourly. I've picked the longest period I could to check total energy usage. 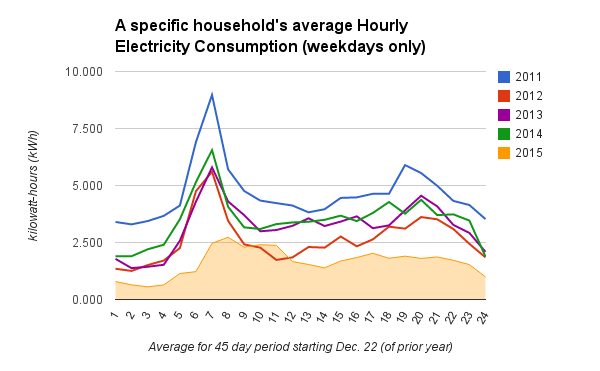 My electricity usage is down about 1750 kilowatt-hours (kWh) to approximately half of what it was the previous 2 winters. I've used over 300 cubic meters of natural gas, which by my calculations translates to about 3250 kWh. - so my overall energy use is up. The wood pile isn't dropping as quickly as most winters, but I don't think the difference would equate to more than a couple of hundred kWh. The 1750 kWh reduction in electricity use will save around $350, while the gas (delivered) will cost maybe $140. 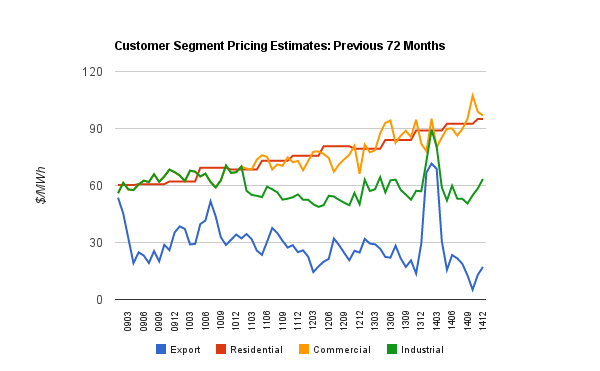 Economic theory dictates lower cost may be one reason overall energy use is up. A second reason for increased energy usage is probably smart controls - in this case the NEST thermostat, and related NEST Protect smoke and carbon monoxide alarm. The electrical heating thermostat's could be programmed (4 settings a day, for weekdays and weekends), but not from the phone, or a computer. I can still sneakily turn down the heat, and reprogram everything cooler, but there's no effort at all in other occupants of the house over-riding me. Worse, for consumption, NEST learns what temperature is preferred, quite well, while being seemingly indifferent to my intermittent desire to feign poverty and by setting it down to 17 degrees. The brattier warmer home seems healthier, and happier, but maybe that's because we aren't thinking of the planet and it's uncertain future. 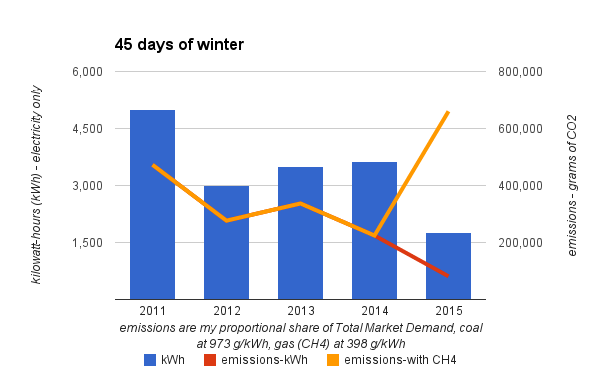 I calculated my emissions over the test 45 day period, using actual hourly generation totals and my share of total market demand. 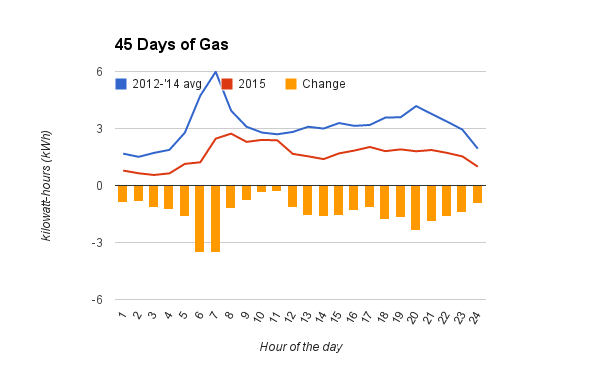 Having dropped in half over the previous 3 years, this household's emissions tripled in the most recent 45 day period. The Liberal apparatus, so willing to spend on wind turbines at rates that needed a carbon price of $300/ton to make sense, is now promising to introduce some form of carbon pricing. I doubt it will substantial, because the only thing I've done with my home energy use is to act like I'm from Mississauge/Oakville, where the votes that elect governments still are. My terms may confuse here, but the graph indicates for years the government has protected Ontario's largest consumers (and all foreign ones) from paying more for electricity. The "Class A" global adjustment mechanism is being expanded, which will further shrink the pool of consumers bearing the burden of electricity experiments. The We are getting more wee. Conservation helps Ontarians better manage their energy costs, lowers greenhouse gas emissions and avoid the costs of building new generation. In our new conservation framework, signed by all of our local distribution companies [LDC's], we have an ambitious goal to conserve 7 terawatt hours by 2030, equivalent to taking 1 in 5 homes off the grid. By my math, if 1 in 5 is 7 all is 35. 35TWh of the 160TWh total market that produces about 6 Mt CO2e of a provincial total of ~160 MT. The focus on reducing electricity use is an asinine focus of energy and environmental policies. I'm sort of ashaamed of my LDC. I try to have a smarter house. My NEST thermostat is much smarter than my old programmable ones and maybe it would be really smart if I could select whether to heat with electricity or gas - or select temperature based on price. I can think of a scenario where controls are enabled with ZigBee to communicate to bring about that. I can't think of a scenario where the IESO and/or my LDC has control of anything in my home that would be as smart as me having control of things in my home. Replacing the hot water heater is a decision I could choose to make. The hourly figures I explored earliest in this blog show my electricity usage has decreased least during the "on peak" morning hours. I was discouraged from changing the hot water tank to gas by my old low-emissions self and the bias from marrying into an electricians family. I think I've reached a basic principle for my personal future energy decisions. Until the government stops pushing electricity costs higher for lower people, or the crematory is done with me, burn baby burn.